Electric Floor Heating Archives | Gordo Sales, Inc. - Industrial Process Heating and Control - Gordo Sales, Inc.
Our electric underfloor heating systems are available for a variety of floor surfaces, including tile, stone, carpet, and hardwood. We have a wide range of heating elements including rolls, cables, and heated floor mats. Any room in the home can utilize radiant heat providing comfort wherever you are. With the installation of heated flooring, your home’s floors will remain consistently comfortable day after day. 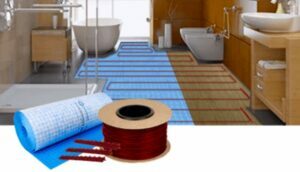 ComfortThe number one reason to install radiant heating under a new floor is absolutely the comfort, a heated floor is literally luxury you can feel but you probably already knew that. CleanRadiant floor heating is a very clean heat since it doesn’t rely on forced air, which can circulate dust and other allergens. SafeAll of our electric floor heating products have been rigorously tested and are cULus or cCSAus listed. Forced Air AlternativeFloor heating isn’t loud like a central furnace, doesn’t dry out the air, and requires no regular maintenance. AffordableElectric floor heating is inexpensive if you put it in while you’re already replacing or installing a floor. In fact, the cost for the system itself is as low as $5 per square foot. Unlike hydronic systems, an electric in-floor heating system doesn’t require expensive pumps or water heaters. Saves EnergyRadiant heating has higher levels of energy efficiency than central air systems because it heats the people and objects in the room directly via infrared heat. Radiant heated floors are also inexpensive to operate, you can heat a typical bathroom for pennies a day. 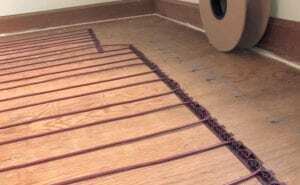 FlexibleUnder floor heating can be used as your primary heat source or as a way to add supplemental heat to rooms that are tricky to heat like the basement or a room above a garage. 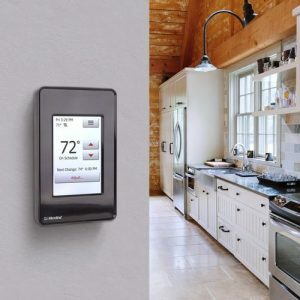 Easy-to-Use ThermostatsThe secret to any great heating system is a great control and we’ve got an entire line of them. However, while a radiant heat system is very cost effective, it still uses electricity. The operating cost for your radiant heating system will depend on a few things like the size of your system, the temperature you’re trying to achieve, and the cost of electricity in your area.